One of the pleasures of throwing pots on the wheel is to develop shapes that challenge one’s technique, while still keeping a beautiful line and sound balance in the form. Size is good – I certainly like throwing big things, but there are other challenges. 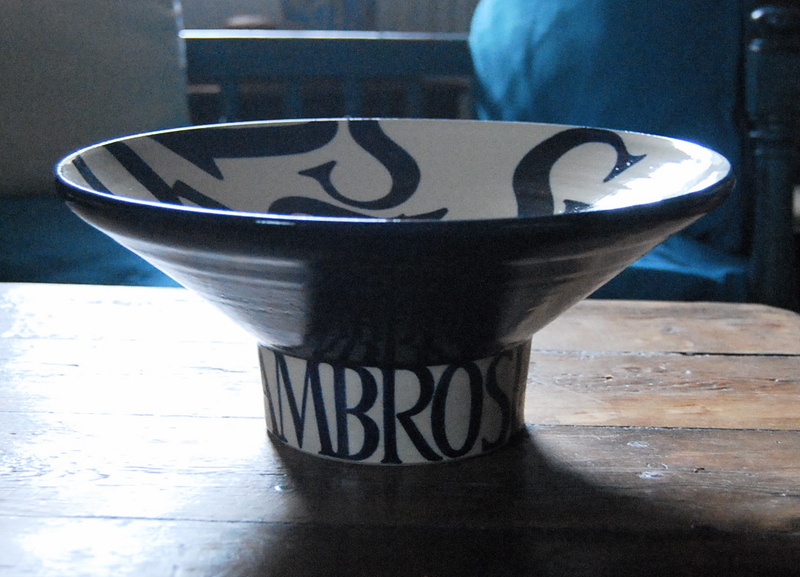 One shape in my throwing repertoire I’ve developed most successfully I call a crater dish. Here, a wide shallow bowl is cantilevered out from a central deep well, the outer line following the inner form with an even thickness of wall. This shape is quite difficult to throw, as there are certain points where the wet clay would prefer to collapse. The trick is in the soundness of the lower supporting well and the tension of the rim. This is a good shape to decorate, a form that can express thought. The text around the outside of the lower well or crater gives the visual impression of an architectural support, a series of arches like a loggia holding up the wide bowl. This well is full of intense colour within, opening up to an enlargement of the text mapping the width and open spread of the upper bowl. Crater dishes (and crater discs, flatter versions, with a shallower central pool) are not usually functional in the domestic sense – they have a slightly more abstract quality – more contemplative containers of something else – a colour, an idea, space – so they’re good for commemorative commissions, which often celebrate love (civil partnerships, weddings) or time (birthdays, anniversaries) or other abstract ideas that are a fundamental part of our lives. 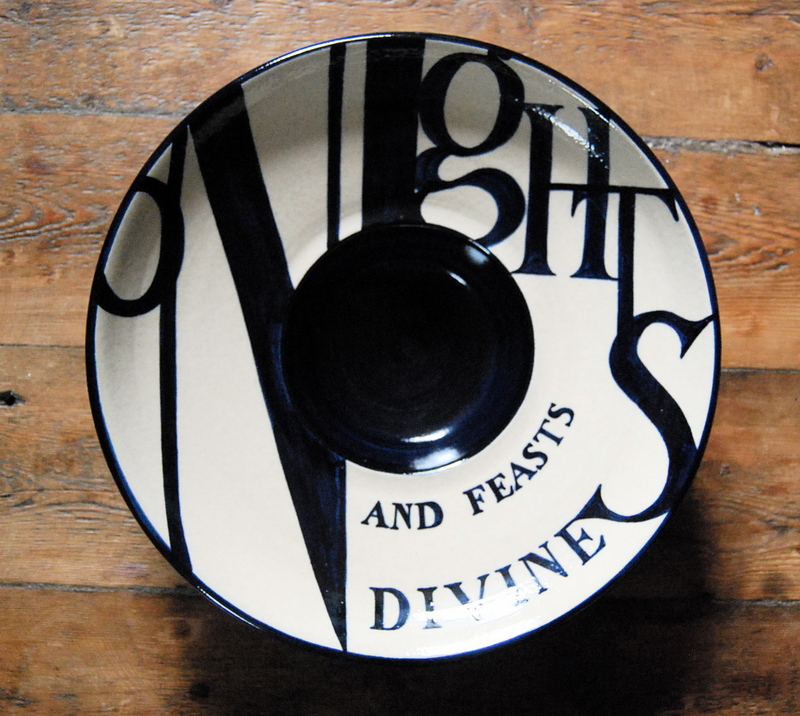 People sometimes ask me ‘what they’re for’ – and though I try not to prescribe too much the uses to which my pots might be put, I have described these pots as ‘like a painting that you can put on the table and turn in your hands to enjoy physically, as well as through sight’. 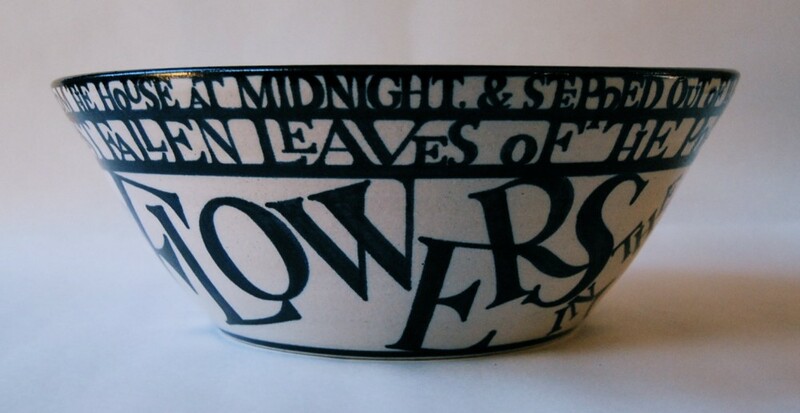 The text is lettered freehand with a brush onto the raw dried clay, inside first, to express visually the form and line of the pot, as well as its purpose and significance – in fact to identify the form with the meaning. 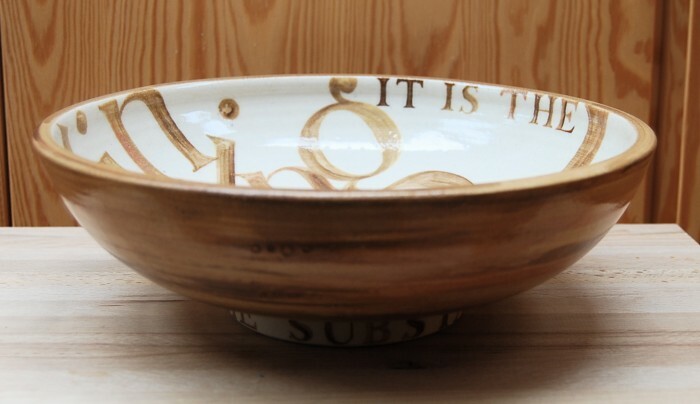 For me, the combination of the physical balance of the form with the setting of the text, as well as the relation between the inner and outer surfaces, and the play of light within the text and within the glaze, makes the crater dish an enjoyably expressive integrated whole – a real thing. 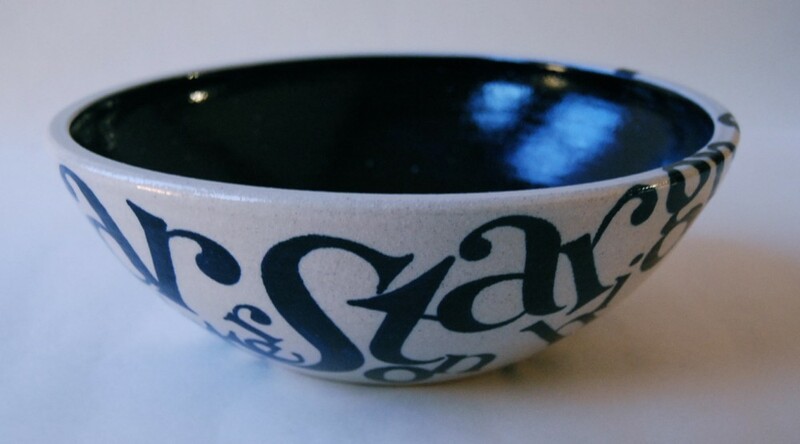 If you’d like to know more about crater dishes or any other work, please leave me a note in the comments box below, or click on contact details for other ways to get in touch. This is how the page looks opened out, showing the torn and folded structure. The vivid text by Phoebe Hesketh evokes the flash of the kingfisher swiftly but lastingly; I have set the text with the aim of giving a concentrated, focused reading without a directly illustrative representation, within an abstract design following the colours, shapes and movement in the text. The painting is in watercolour, acrylic and ink, and the text is lettered with a driftwood pen. For more information about my artist’s books, please have a look at the Bookworks page. If you’d like to know more about this or any work, click here for contact details and information.